Choose from an a regular trade show pop up or eye-catching LED back lighting on a pop up frame with SEG fabric graphics. SEG Popup 4x3 Includes: Channel bars, black side panels, carry bag and Front Graphic. 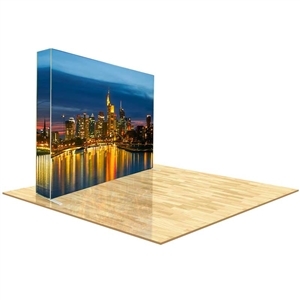 Stand out at your next trade show with our SEG pop-up display stands. Choose from LED back lit or unlit displays. The expanding frame allows for an easy set-up, and the included canvas carry bag makes transport effortless. Our dye-sublimation process creates HD, photo quality fabric graphics from your custom artwork. The ink becomes part of the machine washable fabric which enables you to keep your display fresh year after year, protecting your investment and saving your valuable marketing dollars. Need help with your pop-up display stand artwork? We have a full team of graphic designers that can help you. Call us at 1-866-864-2831.